Pillar pages are comprehensive posts that position your organization as a thought leader on a given topic. The term was coined by Hubspot in 2017, when they completely reorganized their blog and unveiled their new content marketing strategy. That’s why talking about pillar pages goes hand-in-hand with talking about “content clusters” or “topic clusters.” Pillar pages don’t stand on their own—they support (and are supported by) a series of posts that dive into more specific aspects of a given topic. You should really think of a pillar page as the flagship entry in a series of posts. It’s an important part of cleaning up your blog, and it can have a big impact on SEO and the way your audience sees and interacts with your brand. In this guide to pillar pages, we’re going to tackle everything you need to know so you can start revamping your blog—or at least follow a colleague’s conversation about it. And yes, this is a pillar page on pillar pages. Be sure to check out our handy-dandy infographic, too. Let’s begin. A pillar page covers pretty much everything your target audience should know about a topic. It aims for breadth, not depth, and should come across as “[Topic] 101.” It’s a huge interlinking opportunity: every post you will write (or have ever written) about this topic or any of its subtopics should link back to this post, and it should link to any other relevant posts, too. You can’t possibly say everything there is to say about a subject in a single blog post—and for your reader’s sake, please don’t try. But a good pillar page hits the most important aspects of your topic so someone who knows nothing about it can get the basics, and someone who’s familiar with it can still learn something new. Pillar pages and content clusters provide an ideal experience for your readers because you provide clear paths to explore important topics in greater detail. They don’t have to start a scavenger hunt if they want to keep learning or don’t understand a key concept. It’s all right there on your website, organized in a useful way. This also helps Google recognize what your website is actually about, and more importantly, what it’s most useful for. Content clusters, also called topic clusters, are the secret sauce that makes pillar pages so effective. A cluster is a series of posts that directly relates to a topic you want to be known for. These posts tackle the subtopics, questions, concepts, and situations you don’t have capacity to explore in your main post (the pillar itself). While your pillar page covers your topic comprehensively, there’s always going to be more than you can reasonably cover in a single article. If your post gets too long, it becomes difficult to navigate, and therefore, less helpful. For example, some of you might be wondering how pillar pages are different from cornerstone content. That’s pretty specific. So I’m going to defer to this post that compares and contrasts pillar pages to other types of long-form content. Spoiler: they have a lot in common, but cornerstone content focuses on explaining things that are core to your business, so that people can do business with you and recognize the value you provide. Topic clusters help you capitalize on the best opportunities to establish thought leadership, create buzz, or highlight your topic in unique, interesting ways. Hubspot uses a hypothetical pillar page about content marketing as an example. Content marketing is a broad topic that encompasses blogging, but it’s not exclusively about blogging. You can’t have a “comprehensive” post about content marketing without talking about blogging, but you also can’t have a comprehensive post about content marketing that only talks about blogging. A good content marketing pillar page would talk about blogging along with things like social media, videos, email courses, webinars, search engine optimization, and a more thorough look at what sets content marketing apart from other types of marketing. In some cases, like this content marketing example, each of the “subtopics” (social media, blogging, etc.) are also broad topics that may be relevant to your industry and audience. Can a pillar page also be part of a content cluster? Some pillar pages are surrounded by clusters of . . . other pillar pages. This happens when the subtopics that would best support your pillar are broad, relevant topics you also want to build clusters around. 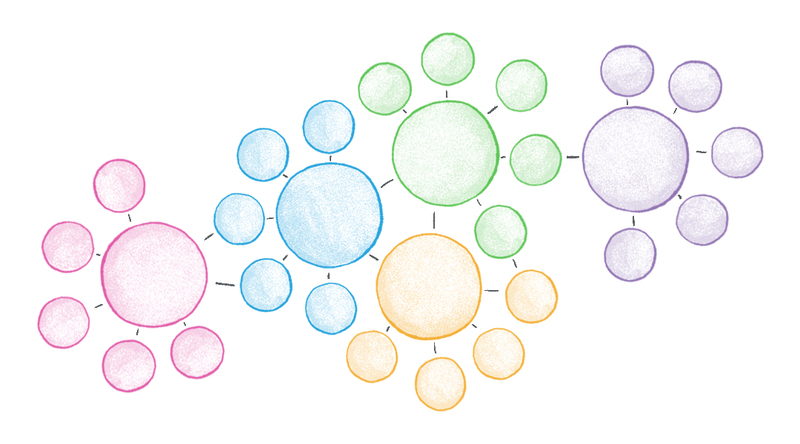 Hubspot’s original diagram of pillar pages shows each topic cluster neatly organized around a single pillar. But that model is really for display only. The reality is that most organizations are going to have some pillars and content clusters that overlap. 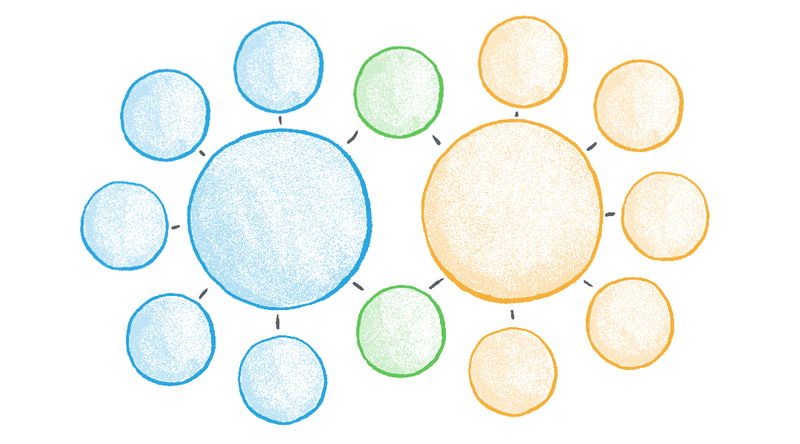 You might have pillars that share content clusters. Pillars that are part of another pillar’s cluster. And while it looks messier, it’s actually not. One of the goals of the pillar page/topic cluster model is to eliminate redundant content. (Which makes your website messy.) But if you don’t have overlap between your clusters and pillars, you’re bound to either have redundant content or significant gaps in your content. If you create a pillar page on “How to Start Investing,” somewhere in there you’ll probably want to link to a page like “What Is an Individual Retirement Account?” or “How to Prepare for Retirement.” Those are super broad topics with high search volume that could easily be pillar pages. But if you don’t allow your content to overlap, you’d wind up creating retirement pages for your “investing” topic cluster, and then creating new retirement pages for a retirement cluster. Whether or not those pages deserve to be their own pillars depends on how relevant they are to your audience and your services, but odds are you’d want each of those topics to be a comprehensive page (with its own cluster), and that all of these investment and retirement related pages would also be part of each other’s clusters. How long are pillar pages? There are no explicit guidelines for how long your pillar page should be, but if you’re going to be comprehensive, you should probably aim for at least 2,000 words, and try to stay under 5,000 (remember, you’ll go more in-depth on subtopics in other posts). Ultimately though, the ideal length will depend on your topic and your competition. That means in many cases, your pillar should be as long or longer than your competition. But that’s not always the best approach. If the search engine results pages (SERPs) for your topic are dominated by jargony essays sprawling across 3,000–4,000 words, you might be able to serve your audience better with something less wordy, more visually compelling, and with more links to supporting content. The point is to make something more useful than what’s already out there. There are also no hard-and-fast rules about what format a pillar page has to follow. The important thing is to think about which formats lend themselves to thoroughly covering your topic, and which ones would be more appropriate for part of a supporting cluster. Think about what you would want to see if you were trying to learn more about a topic. Are you trying to figure out how to do something? Do you just want to understand what something is, or why it’s important? Maybe it’d be more helpful to skim the main points? There are many types of pillar pages, but here are a few common ones. A guide is a common structure for pillar pages because it sets the expectation that your page is going to be broad and comprehensive. People generally trust that the “definitive guide” to a topic is going to cover everything they need to know about it, and that a “beginner’s guide” won’t assume you already know everything. Guides will often include sections about what something is, how to do it, and why it matters, but each of those “sections” can also be the framework for a pillar page on their own. When people Google a concept or term, they often just want to know what it is. So it can be helpful to organize your pillar page around the simple question, “what is [concept or term]?” While you can probably answer this question in a few hundred words (or a sentence), you’re trying to provide the most helpful answer, and that’s naturally going to lead to more questions—like why this concept matters, or how to implement the strategy you just defined. Framing your guide as why your topic matters can be a helpful way to show your audience that you plan to go deeper than the surface level “what is ___” questions. You should still provide that basic information, but the bulk of your page is going to focus on how the topic impacts your audience—or their audience. Similarly, your audience might just want to how to solve a problem. By organizing your post as a “how to” guide, you’re promising to walk them through a process, and you’re probably going to spend more time on the individual steps than you would in a broader guide—but a page like this should still have sections explaining important concepts and why the process is important, why their aspiration is worth reaching, or why the problem is worth solving. Not every topic is best suited for a “complete guide,” and some search engine results pages (SERPs) are already stuffed with “definitive” guides. So a roundup of the best tips, tactics, or facts relating to your topic can be a great way to make your pillar page stand out. Going back to Hubspot’s example, suppose you want a pillar page on content marketing. You could create a guide. But there are already tons of those. A page on “14 Content Marketing Strategies” or “14 Ways to Do Content Marketing” could provide an overview of content marketing and provide a simple way for both beginners and veterans to get value from your content. Listicles signal to your audience that you’re going to have a skimmable page. They’re easier to consume than “complete guides” because the organization is always consistent, and people know they can easily scroll through your main points until one catches their interest. Why are pillar pages important? Pillar pages have several important roles. They help you organize your website as it currently exists by getting rid of redundant content and making sure your pages all lead toward your most relevant goals. Perhaps even more importantly, pillars shape the future direction of your website. Deciding what your pillar pages and topic clusters are going to be is essentially deciding what your website will be about from now on. As a byproduct of that improved organization, they can improve your sitewide search engine optimization. But pillar pages also contribute to SEO by helping you prioritize interlinking and creating substantial content around important terms. Most organizations use pillar pages for lead generation as well. Since you’ve got all that traffic coming to these pages, it makes sense that you’d want to actually do something with that audience. Additionally, pillar pages can be an important part of your content marketing efforts like onboarding, email campaigns, etc. If you’re not careful, content calendars can create problems for your website. They can push your writers to focus more on getting posts out the door than writing quality content, and they can easily lead to redundant content. For years, the main thing marketers heard about blogging was that you had to consistently produce content to grow an audience. But after cranking out a couple posts per week for the last few years, many organizations have accumulated hundreds of pages that get zero views per day. And that means when Google crawls your website, it sees a whole lot of nothing. Even if you have some really successful pages, the rest of your website looks like a ghost town. And nobody wants to go to a ghost town. So Google isn’t going to send them there. Auditing your blog content should be part of your annual (or even quarterly) routine, but switching to pillar pages and content clusters can help with this too: it forces you to decide what your website is really about, and to eliminate the things that fall outside of that. It also means updating or recycling posts that relate to your pillars, so all those pages without traffic may finally get some use again. Pillars force you to think about how your pages relate to each other, which helps you streamline the paths your audience (and your friendly neighborhood Google bot) has to follow. And by creating more relevant connections between your pages, you increase the likelihood that someone will stay in your content ecosystem for longer. They also lead you to think about what posts should exist and help you avoid writing duplicate content in the future. If you organize your content around pillar pages, the gaps in your content library become obvious. Once you establish your pillars and decide what your website is really about, your content team will have clear direction moving forward. Like other types of “big content,” one of the goals of pillar pages is usually to rank for specific keywords. Once you decide what you want your organization to become known for, you look at how your audience is currently learning about those topics and write comprehensive posts. Longer posts don’t automatically rank in Google, but generally speaking, the more comprehensive you are, the longer your post is going to be, and the more comprehensive you are, the more search queries your post is relevant to. So since good pillar pages are supposed to be comprehensive, good pillar pages also tend to rank. And since you’re redirecting or deleting ineffective or redundant content, that means Google only sees the good stuff. This helps your site appear more relevant to your topics and valuable to your audience—which Google likes. But another reason why pillar pages give your SEO a boost is that they capitalize on one of the most important things you can do to improve your rankings: interlink your content. The pillar page/topic cluster model is designed to create opportunities for interlinking, both with content you have right now and content you decide you need to create. Interlinking is helpful to your audience because it gives them a convenient way to “go deeper” into your content by exploring a specific point or concept. That means visitors stay on your website longer on average, and there are more opportunities for you to lead them into your marketing funnels. The pages within your topic clusters will likely link to each other here and there, but all of them should link to the pillar page they were designed around. This helps Google recognize that your pillar page is the best place to send people to learn about that topic. It signals that this is the most important, comprehensive page on that topic within your site. Pillar pages naturally lend themselves to lead generation. If a pillar page ranks for big keywords surrounding its topic, you’re going to have a steady stream of visitors. You can’t guarantee that you’ll ever see any of these visitors again, but if you dangle the right lead magnet in front of them, you can get them on an email list. Speaking of leads, check out how we helped a client get more than 12,000 email subscribers for 24 cents a pop. Assuming you have a retargeting pixel set up, pillar pages can also be a great way to build an audience for remarketing. Maybe they didn’t stick around long enough to see your lead magnet. Show it to them in an ad. Or it wasn’t relevant to them—so you can show them a different one. You could even use retargeted ads to point these people to another important post in that topic cluster or a related pillar page, where presumably, they’ll encounter another lead magnet. And even if your pillar page doesn’t rank, it’s still going to be one of the pages your content points to the most, so people are going to see it if they hang out on your website long enough. So it’s always a good place to try and generate leads. Some marketers assume that pillar pages lead to ebooks and email captures, and that their usefulness ends there. Your pillar pages are your best effort to teach people everything you think they should know about a topic you believe is important to your business and relevant to them. You spent time creating something that establishes thought leadership and serves as a hub for people to go deeper into your content. Why would you waste that work by only using it for lead gen? Pillars and clusters are perfectly suited for your onboarding campaigns, lead nurture, remarketing to your customers, and driving your audience further down your funnels. Creating pillar pages isn’t just about filling the top of your funnel. Pillars and clusters should contribute to almost every facet of your digital marketing. Now, let’s talk about how to actually make them. How do you create pillar pages? It takes a lot of work to create pillar pages and topic clusters. But the payoff is worth the effort. You’ll get more out of the work you’ve already done, and your future work will be more efficient. If your organization has been blogging for a while, creating your first few pillar pages may not be as daunting as you think. You’ve probably already published a lot of content that relates to the topics you want pillar pages on, some of which could be part of your topic cluster, or even your pillar page. The very first thing you need to do is decide what topics your website needs to help people learn about. These topics may directly or indirectly relate to your products or services. They could be problems or aspirations your audience has, or things they need to understand in order to do their job or serve their customers more effectively. Think about what you should be known for, and what your organization is best equipped to educate your audience about. Once you know the categories you want to be known for, you can research how your audience currently explores those categories. You want to become an authority on solar panels? What do people search on Google when they want to learn about them? Commercial and residential solar panels have different incentives, costs, and audiences, so it would be wise to build separate pillars around each of these concepts and the search terms people use to learn about them. This is where you’ll decide what specifically you’re going to write about. Your pillar pages will focus on the search queries that most directly relate to what you want to be known for (not necessarily the keywords that have the highest traffic potential). Once you have your pillar, you can map out any relevant topics that relate to your pillar and align with what people are actually searching for. A lot of brands make the mistake of picking keywords they want to rank for and then talking about themselves as much as possible in relation to that topic. That’s not how SEO works, and it won’t produce an effective pillar page. You need to focus on what people want to know when they Google those keywords. Who are they? What situations are they looking to address? What are they expecting to see on your page? It helps to look at the pages that already rank on the search engine results pages (SERPs) for those terms. What is your competition saying? What are they not saying? Are there problems or questions they’re failing to address? What would you want to know if you entered those search terms, experienced those problems, or had those aspirations? Outline all the points you’ll need to hit. The more your pillar page assumes people know, the less helpful it is. Be sure to cover all of the “stupid questions” people may have right off the bat, and dedicate sections of your page to questions that take more time to answer. Remember, you want this to be a broad, comprehensive exploration of your topic. Outline every question people could possibly have based on what you’re seeing in the SERPs and what you think they’re looking for. Frankenstein old posts together . . . Some pillar pages don’t take much original work. If you’ve been writing about a topic for years, you probably already have plenty of posts that cover many (or all) of the things you outlined. In that case, you can just merge old posts to create new pillar pages. Some of these pages may have been dead for years. They weren’t getting traffic or doing you any good. Others might be pages you refer to a lot, or that rank for specific search terms and give you a steady stream of traffic. Depending on the page, you may need to create redirects. If you just copy-paste it all together, it’s probably not going to look natural. Odds are you’ll have to do some stitching here and there, add some transitions, change a few headers, update anything outdated, and fill in some gaps. But the end result will be a beautiful amalgamation of all your old content, neatly spliced together and reanimated so that it looks like it was meant to be this way all along. Like Frankenstein’s monster would’ve been if, you know . . . it was better. It doesn’t always make sense to fuse old posts together. Remember, you want breadth, not depth. Through your research, you might find that the posts you already have don’t really address the issues people are searching for, or they’re too specific to be helpful in a broad, comprehensive post. Merging all those posts might create something ugly, clunky, and . . . monstrous. Besides, if you use all your old posts to create a pillar page, what do you have left to link to it? Where’s your topic cluster? If the posts you already have focus on specific aspects of your topic, it probably makes more sense to just link to them—and link to your pillar from them. Starting from scratch is a great way to ensure your pillar page delivers exactly what your audience needs, and that it’s organized in the most helpful way. Even if you have all the right information, your page isn’t going to rank (or be helpful) if that information isn’t arranged in a way that’s easy to digest. Imagine if you were looking for specific information about a topic, and when you clicked on a “definitive guide” to that topic, you encountered a wall of tiny text. One massive paragraph that scrolls forever and ever without any breaks of any kind. It might have what you need in it, but the page is pretty useless. 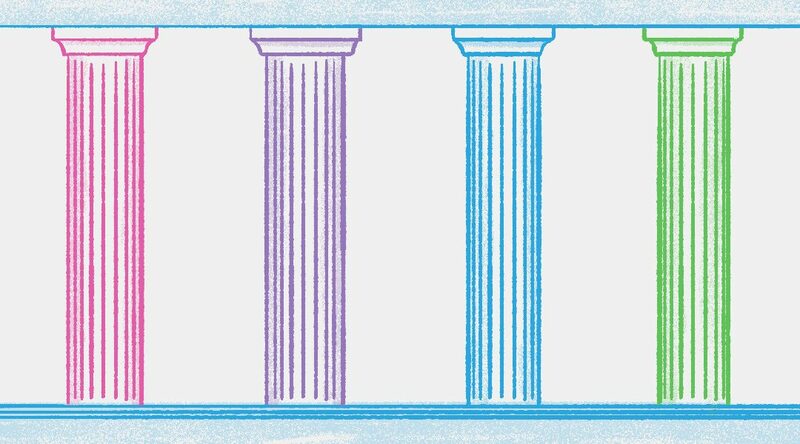 When you’re creating your pillar, you want to think about the wide range of people who may visit it, and the wide range of things they may be trying to learn about your topic. How can your page serve all of these people at once? As much as possible, break up your text with headers. Use H2s and H3s to signal the main ideas (or the questions you’re going to answer) so that people don’t have to look very hard to find the specific things they want to learn about. For longer pillar pages, jump links can be really helpful too. You could make a simple “table of contents” after your introduction that uses jump links to let readers skip ahead. Infographics are another great way to make your information easier to consume. It won’t take the place of all your copy, but it provides another way for people to quickly find what they’re looking for and understand your basic points. Relevant images can also help break up that wall of text and make your page less intimidating. So as you’re creating your pillar, try to think of the sections that would be helpful to explain visually. Organization is extremely important. In some cases, your competition may have more expertise and cover a topic more thoroughly than you do . . . but if it’s poorly organized or looks terrible on mobile devices, you can still provide a more helpful post by providing a better reading experience. As you’re outlining and writing your pillar page, you’ll probably find that there are sections you could go into more detail on. And during the research phase, you may find related topics people are searching for that don’t fit into your pillar but are still worth addressing. 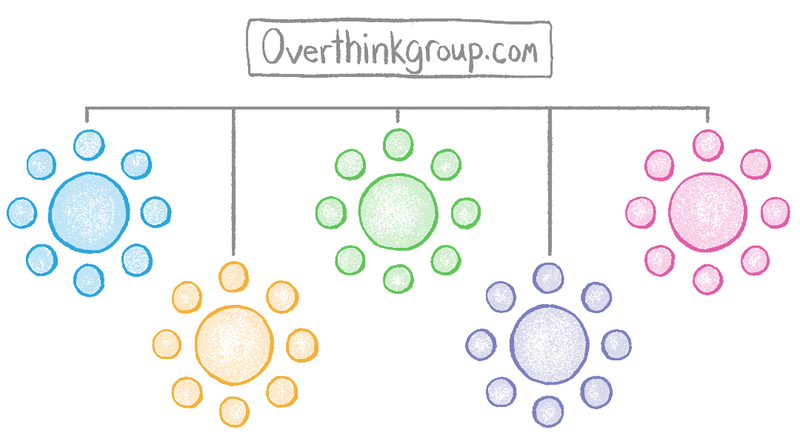 There’s no limit to the number of posts that can go in your topic cluster. If it’s relevant to your audience and helps you establish authority on a topic you want to have authority on, create a post for it. There are also no requirements for what kinds of posts and pages can be part of your cluster. The point is just that you’re creating an interconnected network of pages that helps people conveniently explore your topic to their heart’s content. Your topic cluster could include interviews with thought leaders in your industry (or your in-house experts), listicles, other pillar pages, newshacks, video pages, FAQ pages, longer posts that answer basic questions—really, they can be just about anything. One of the biggest things that makes pillar pages so effective is interlinking. You’re making a conscious effort to point relevant pages back to this one. Pretty much any time your site mentions this topic, it should point back to this pillar. This goes for past and future content, even if it’s technically “outside” of that pillar’s topic cluster. Let’s keep playing with Hubspot’s example. If you’re writing a blog post on, say, PPC advertising, that’s probably not going to fall within the topic cluster on content marketing. Even so, if the phrase “content marketing” naturally occurs in that article, it makes sense to link that phrase back to your pillar page on content marketing. I hate to break it to you, but it can take years for a new page to rank in Google. (Which is part of the reason you should be creating pillar pages right now.) Pillar pages in some industries and on some topics will be able to rank much sooner (we’ve seen pages rank in just a few months), but generally, you should expect it to take a long time. However. If all of a sudden your page starts getting a ton of visits, and people spend a long time on your page (a good sign that it’s valuable), and perhaps it gets some external links, that can really speed up the process. Promoting your pillar page helps Google learn that your page is relevant to people who want to learn about your topic faster. What are your pillar pages? Building pillar pages isn’t just a strategy for increasing organic traffic or growing an email list. Creating them is an important exercise every brand should go through to determine what they want to be known for, what their audience is looking for, and what purpose their website serves. By investing time and energy in creating pillar pages now, you can shape the direction of your content marketing for years to come. This post is ridiculously thorough and helpful AND it requires an immense amount of heavy lifting, not to mention a good wire-framing or mind-mapping tool. I like how helpful you’ve been while pointing potential clients and customers to your services. Pillar pages are definitely not within most clients’ core competency. Nice work!